There’s a persistent debate in the food scene, and it can grow very heated at times, even among friends. Do you want to know what it is? It’s this: doughnut vs. donut. What’s the correct way to spell it? Are both correct? Can they be used interchangeably? Is one fried and the other baked? As for me, I’m usually too busy burying my face in a platter of glazed carbs to give two hoots about it. Spell it however you want, just hand over the goods! 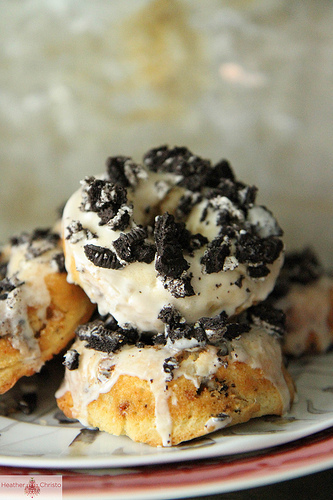 However you and your closest friends choose to resolve your donut/doughnut spelling squabbles, just make sure you discuss it over a batch of these Cookies and Cream Donuts from Tasty Kitchen member Heather. 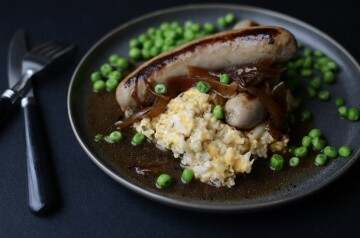 I was drawn to this recipe not just because I knew it would be a home run (because everything that comes out of Heather’s kitchen is! ), but because it’s packed full of my favorite: Oreos. 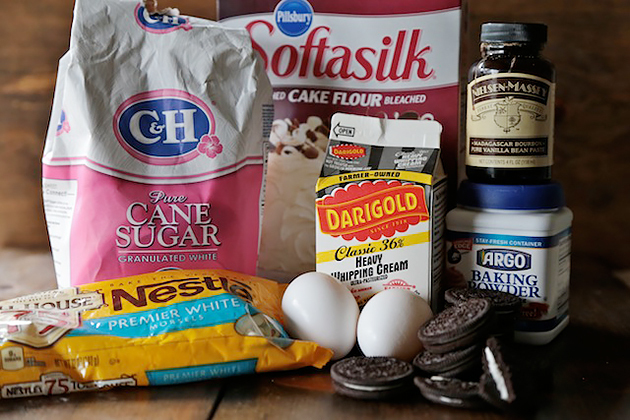 For your ingredients, you will need a few basics, including cake flour, sugar, baking powder, salt, cream, eggs, vanilla and melted butter. One ingredient my store didn’t carry was Hershey’s Cookies and Cream Pieces, so I substituted white chocolate chips and chopped up Oreos instead. 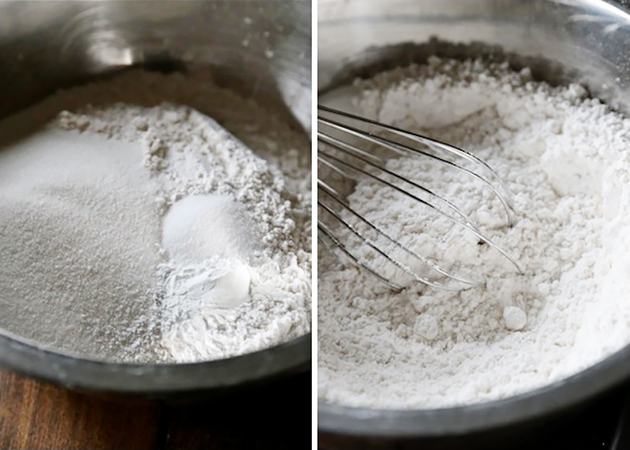 Into a bowl, whisk together the flour, sugar, baking soda, and salt. 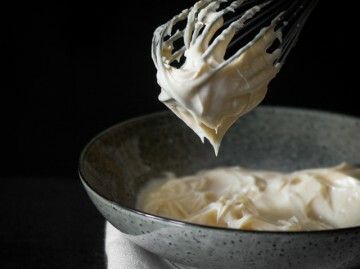 Next, in another bowl, whisk together the cream, eggs, vanilla and butter. Beat these together until combined. 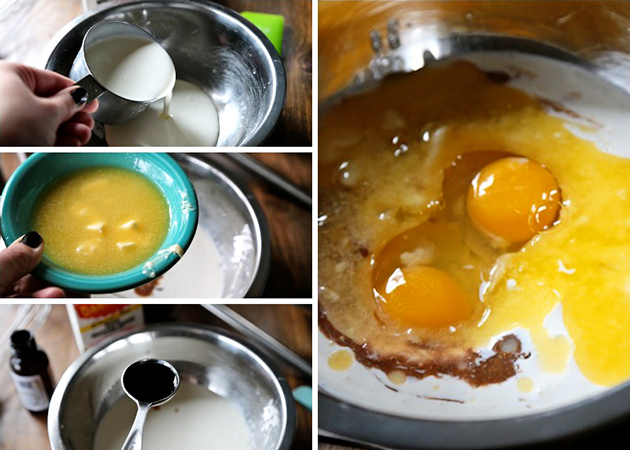 Pour the cream and egg mixture into the dry mixture and fold together until just combined. And don’t forget the cookies and cream pieces. As I mentioned earlier, I had to make a substitution here since I couldn’t find the cookies and cream pieces. I substituted 1/2 cup of white chocolate chips and 1/2 cup of chopped Oreos here. It worked like a charm. Fold these in until just combined. 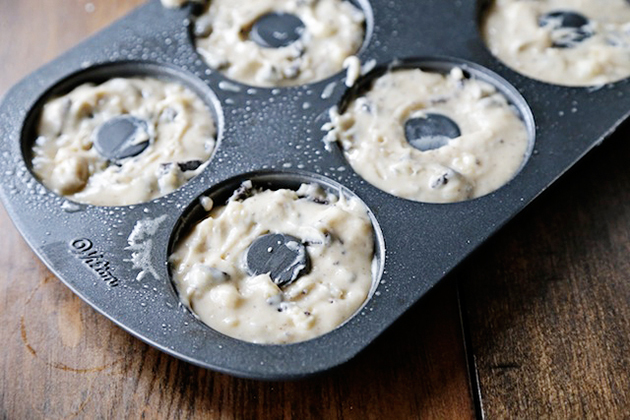 Now, spray a donut pan to help the donuts release after baking. Fill each cavity with batter. Bake donuts for 10–12 minutes, or until they are golden brown on top and when a toothpick inserted into them comes out clean. Remove them from the pan and cool them on a wire rack. 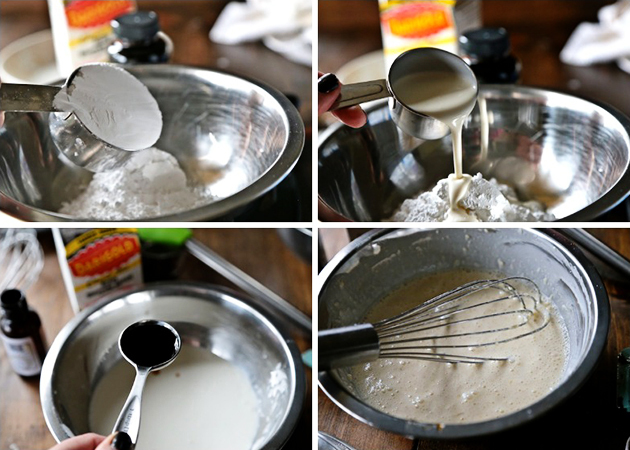 In a bowl, whisk together the heavy cream, vanilla and powdered sugar until smooth. It may be thick, but that is good. You want to make sure the cookie pieces stick to the top and don’t slide off. 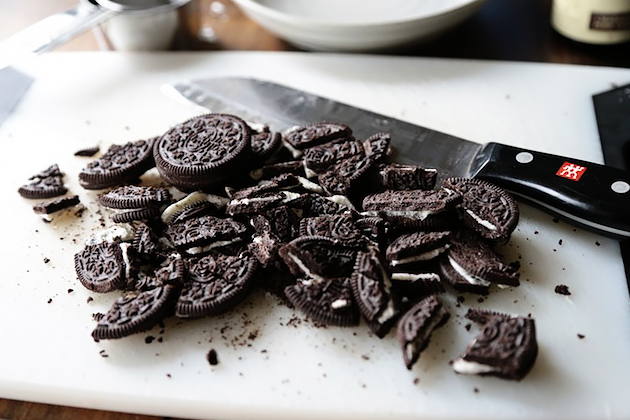 Crush additional Oreos if necessary, and place on a plate or in a bowl. 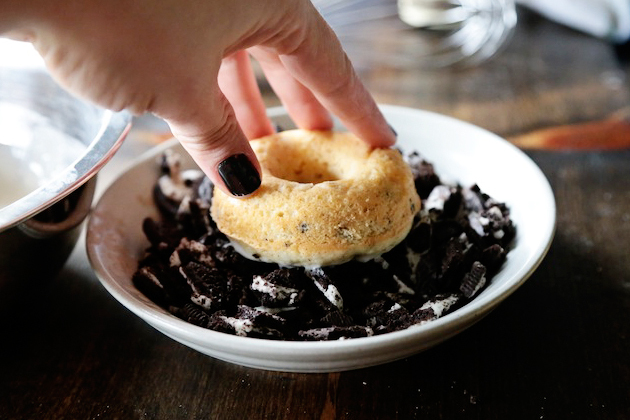 Dip the top of each donut into the glaze and then invert into the crushed Oreos. Place back on the wire rack (with something under it to catch any glaze that drips off) to set. Then, serve! If you can’t get enough of these Cookies and Cream Donuts from Heather, be sure to check out more of her incredible creations, like these Chicken Flautas with Spicy Avocado Sauce/. Be sure to rifle through her TK recipe box for more delicious creations. What is your favorite donut combination? Do you like the traditional types, or do you shake it up with new flavors? Share your favorites, and links, in the comments so we can get some new inspiration from our Tasty Kitchen Community! 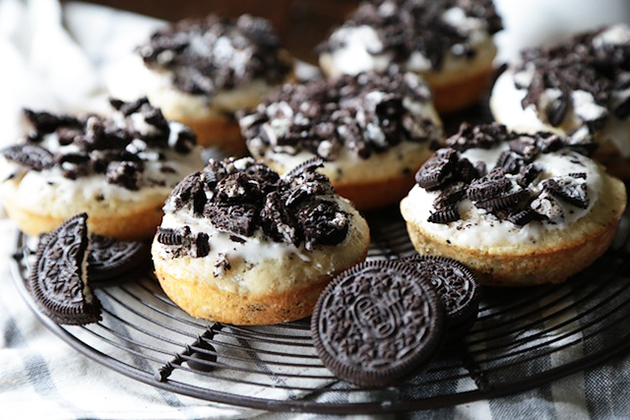 Baked cookie donuts slathered in creamy glaze and crushed Oreos! 1. Preheat the oven to 350 F. Grease donut pans well with baking spray. Recipe makes roughly 18 full size donuts. 2. Roughly chop the cookies and cream pieces and set aside. 3. Sift together all of the dry ingredients (flour through salt) in a large bowl. 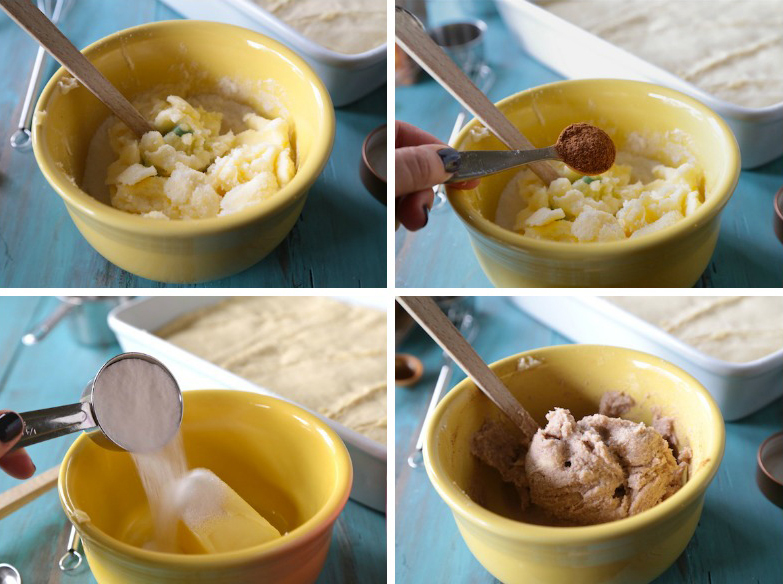 In a smaller bowl, combine the cream, eggs, vanilla and butter and whisk together. 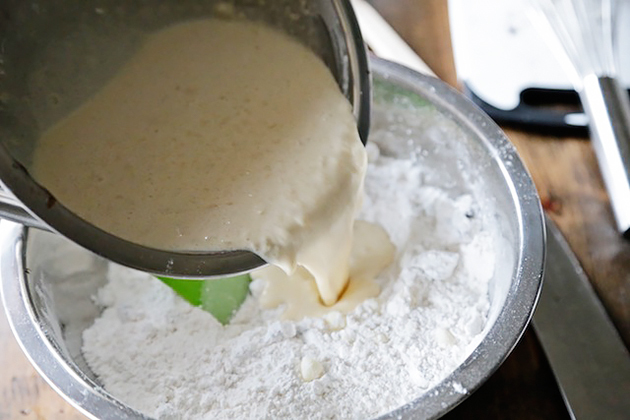 Pour the wet ingredients into the dry ingredients and fold the batter until well combined. 4. 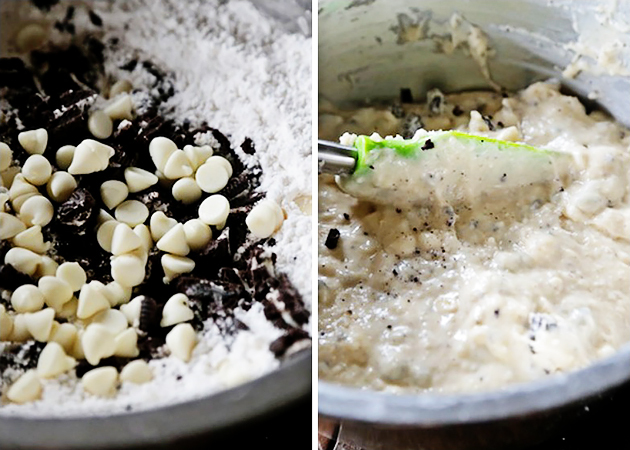 Fold in the cookies and cream pieces. 5. 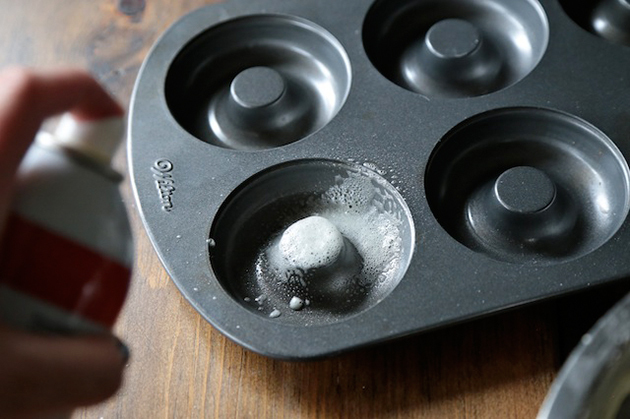 Either spoon the batter into the prepared pan, or transfer the batter to a Ziploc or piping bag, snip off a corner of the bag and pipe into the donut pan (it’s a little neater this way). 6. Bake the donuts until just cooked through and golden on top 10-12 minutes. 7. Remove pan from the oven. Let the donuts cool on a wire rack after turning them out of the pans. 8. While the donuts are cooling, make the glaze by whisking the cream, vanilla and powdered sugar together in a medium sized bowl. 9. Dip the cooled donuts in the glaze until they have a nice thick coating. Generously sprinkle on the crushed Oreo chunks and crumbs. It’s only a little embarrassing when you find yourself going to the same restaurant every Friday night, the guys behind the counter greeting you by name with your order memorized. Beef and lamb gyros with rice and hummus with a baklava for dessert, of course! But I realized I needed to take a break from take-out and try my hand at making my own gyros. Then I found Julie’s recipe for Grilled Lamb Meatball Gyros! It was fate, and I know you will revel in these as much as I did. The ingredients list may seem long, but don’t let that deter you. If you want to substitute pre-made tzatziki sauce and pre-made pesto, I understand, but making it from scratch is pretty simple and will really elevate these gyros to a whole new level. 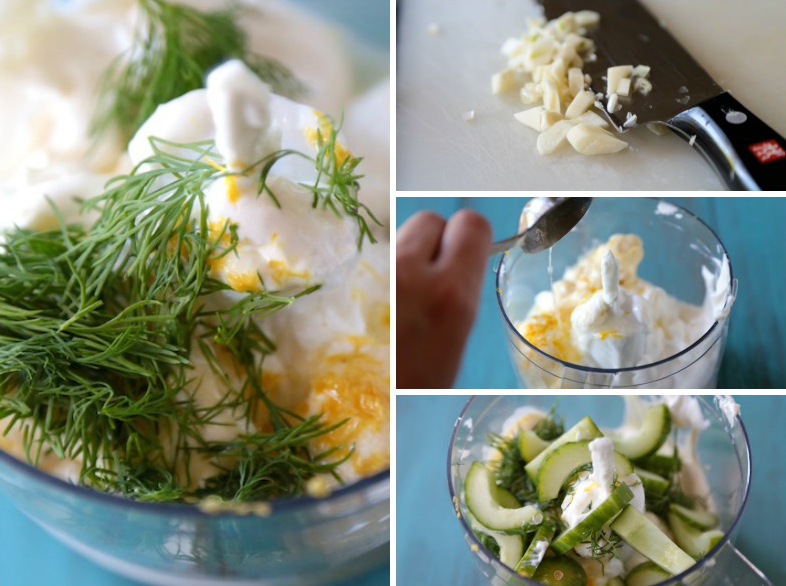 For the tzatziki, gather plain Greek yogurt, sour cream, mayo, lemon, garlic, dill, sugar, cucumber, and salt and pepper. Note: Julie says you can use either sour cream or coconut milk, and promises that the coconut milk version is amazing. I went the sour cream route, but do give the coconut milk version a try sometime! 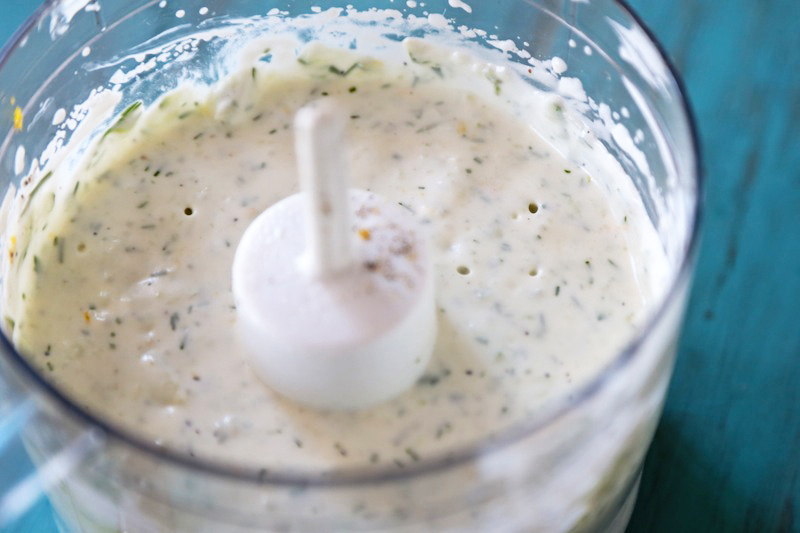 One of the best things about homemade tzatziki is that it’s a one-dish treat—simply combine all of the ingredients in a food processor and puree until smooth. Scrape down the sides once through the blending process to make sure it’s all blended evenly. Place it in the fridge until it’s ready for use. 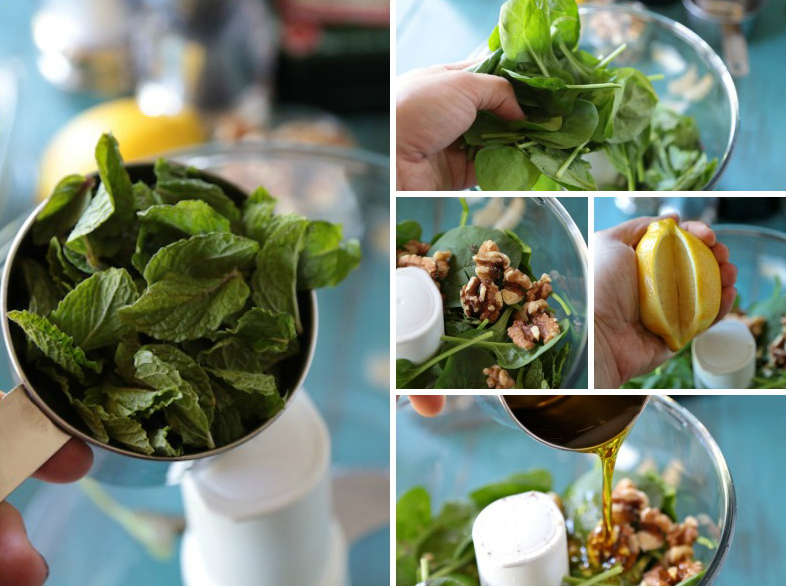 Next, gather all your ingredients for the mint pesto, including mint, spinach, nuts (I used walnuts), garlic, lemon and salt and pepper. 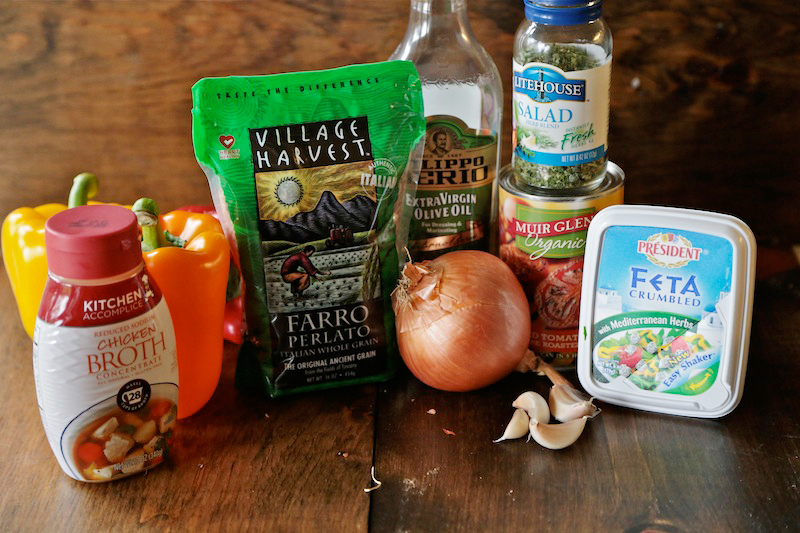 Just like the tzatziki, combine all of the ingredients in a food processor and pulse to combine. Check the seasoning to suit your taste and add a little more salt and pepper if needed. Make sure it works for you! 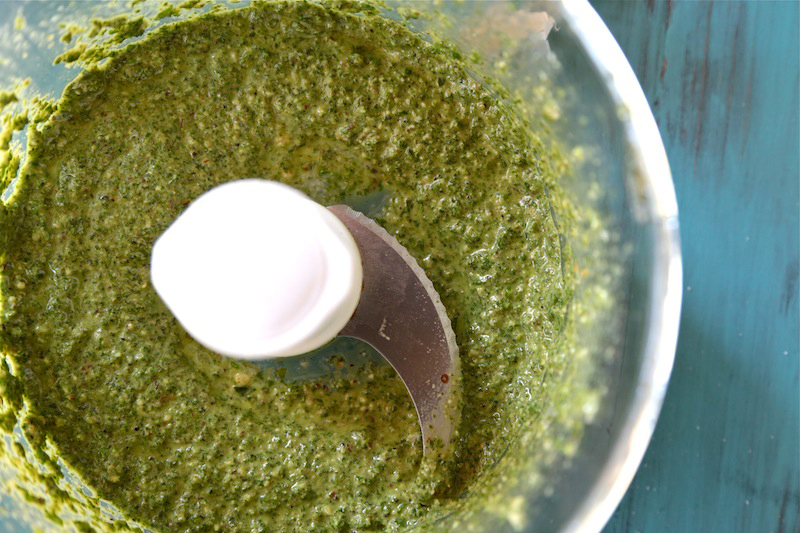 Set pesto aside to until gyros are ready. Now, preheat your grill to medium high heat and prepare all your ingredients for the meatballs. My store didn’t have lamb, so I used ground turkey instead. Don’t forget your Dijon, onion, more garlic (because you know that’s never a bad thing! ), egg, breadcrumbs, ground coriander, cumin, ground cinnamon, and pepper. Grab the cooking spray too! 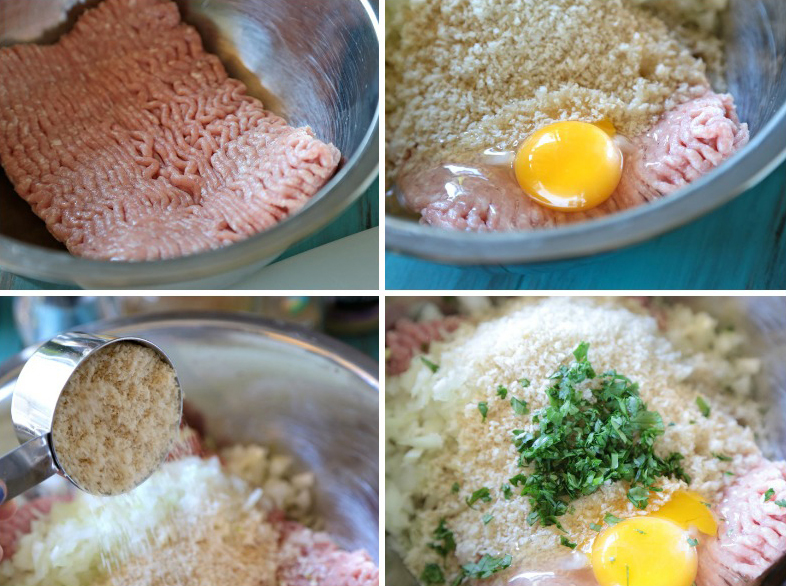 In a bowl, combine the ground turkey, egg, breadcrumbs, cumin, and all the remaining ingredients into the bowl. Use your hands if you’re feeling daring, or a spatula. I used a large cookie scoop to form the meatballs to keep them uniform in size. Just scoop and roll. Then, onto the grill they go! 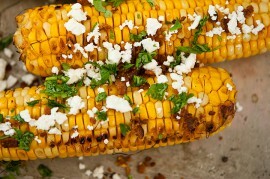 Let them grill uninterrupted, until they released naturally from the grill to turn. Don’t force them to turn or they will fall apart. 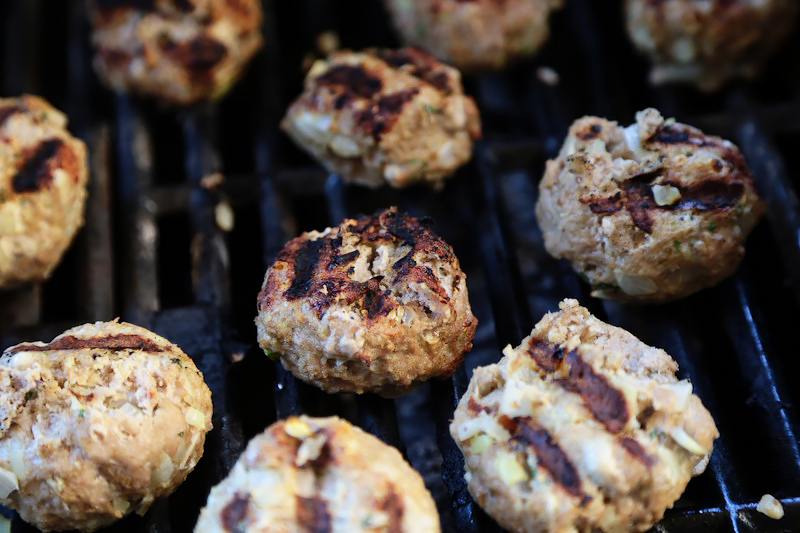 Grill until they reach safe cooking temperature, about 165ºF for ground turkey. Remove from the grill. To assemble these beauties, split the pitas and add a couple of meatballs inside, pouring the pesto and tzatziki over the top. Don’t forget the additional chopped up cucumber and feta! 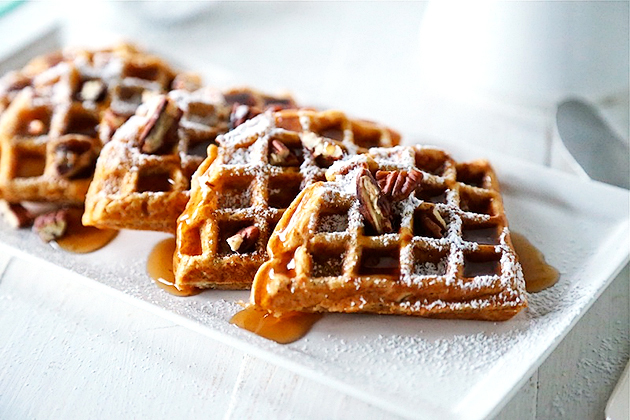 Devour these immediately. Then toss out that take-out menu because you won’t be needing it again any time soon! Thanks for sharing your recipe, Julie! 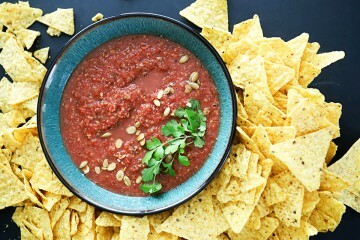 If you need more inspired creations, check out Julie’s TK recipe box. What is your favorite take-out fake-out? Leave a comment below, or share a link for all to see! See post on Julie Andrews’s site! 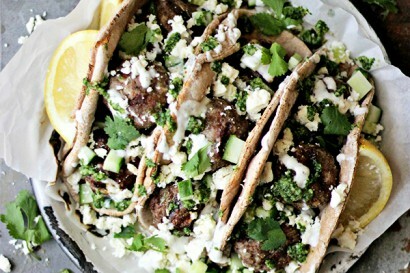 Grilled lamb meatball gyros with mint pesto and coconut milk tzatziki. 1. 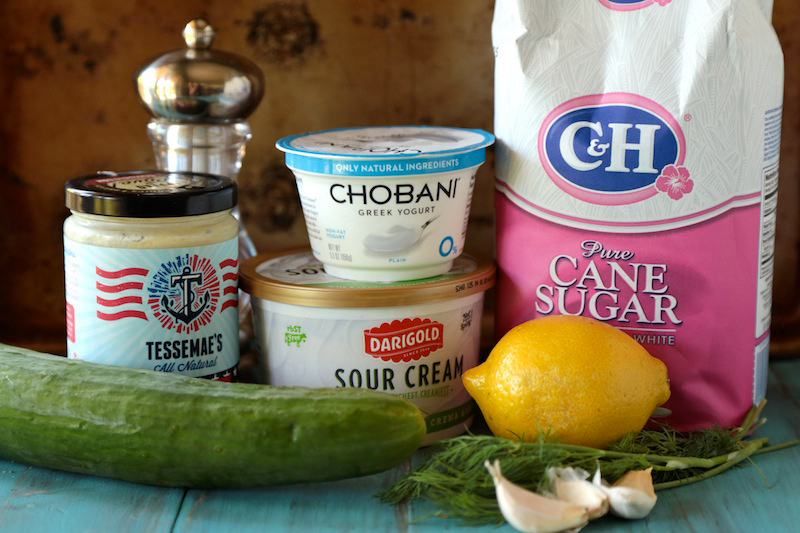 For the tzatziki sauce: Combine all of the tzatziki ingredients (yogurt through sugar) in a food processor. Season with a dash of salt and black pepper; pulse until smooth. 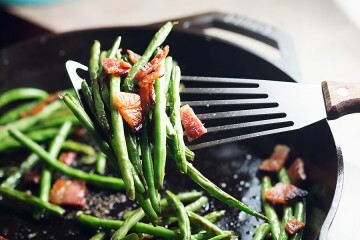 Taste and adjust seasoning, if necessary. Add diced cucumber and fold with a spatula. Spoon into a bowl and refrigerate. Rinse food processor with water. 2. 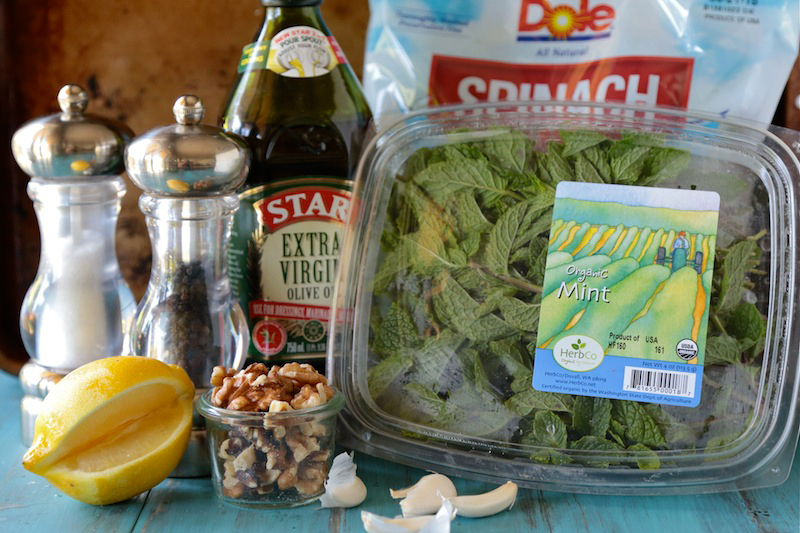 For the mint pesto: Combine ingredients (mint through lemon) in a food processor and add a dash of salt and pepper. Pulse while drizzling olive oil in through the vegetable shoot until you reach desired consistency. Taste and adjust seasonings, if necessary. 3. Preheat a grill to medium high heat. In a bowl, combine all the meatball ingredients (except cooking spray). Work with your hands until everything is thoroughly combined. Form meatballs using your hands and place them on a plate. Brush meatballs with canola oil or spritz with cooking spray. Place them on the grill and cook, rotating a few times, about 8-10 minutes or until cooked through. 4. 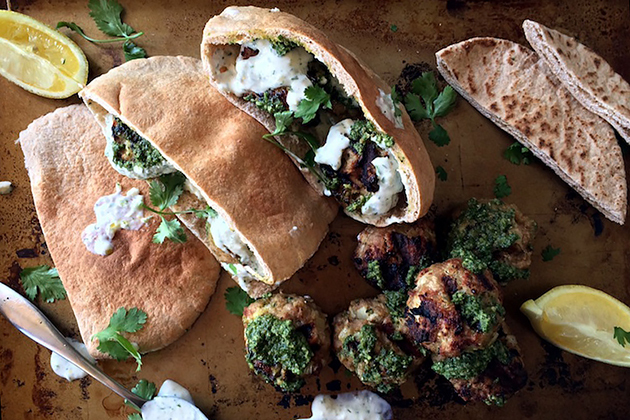 To serve, place meatballs in toasted or grilled pita bread. Drizzle with tzatziki and mint pesto and top with cucumbers, feta and fresh cilantro leaves. Just like the fortune cookie at the end of my Chinese take-out, the sopapilla at the end of the night out at my husband’s and my favorite Mexican restaurant is what I look forward to most. That little bit of sweet and crunchy just seals the deal. Okay, fine, I like the margaritas too. And the chip basket. And the cheesy enchilada. Fine, it’s all amazing, but you can’t deny the absolute crave-ability of those little crunchy sopapillas. And making them into Sopapilla Cheesecake Squares? Are you kidding me? Signed, sealed, delivered, I’m yours! Talk about the easiest recipe ever! 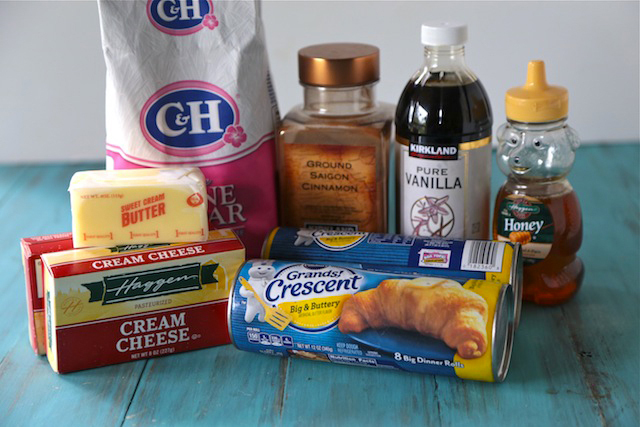 Jennifer says bring with you two packages of cream cheese, some sugar, vanilla extract, refrigerated crescent rolls, and a little cinnamon, butter, and honey. Preheat your oven to 350 degrees. Spray the bottom of a 13×9 inch pan with nonstick spray. Roll out one of the two crescent dough rolls out into the pan. Gently press the seams together so they all adhere. 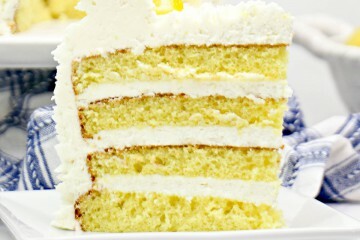 Next, whisk together the cream cheese, 1 cup of sugar, and the vanilla until smooth. 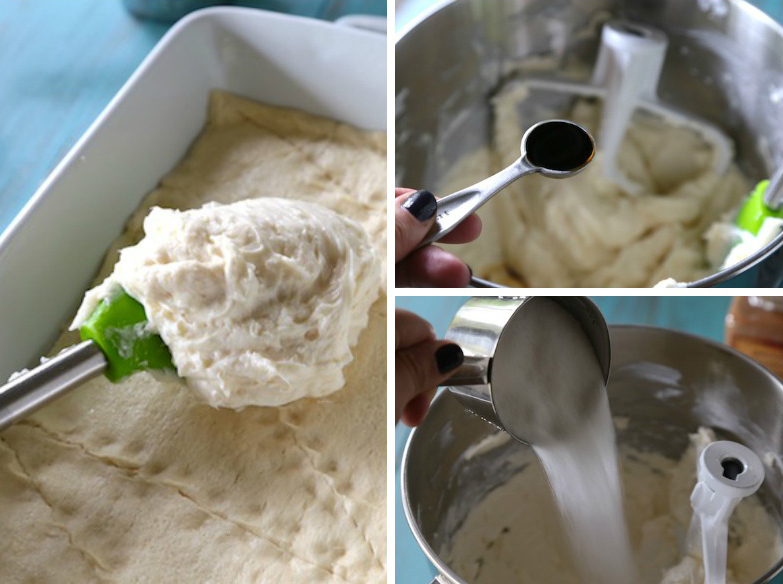 Spread the mix onto the crescent rolls in the bottom of the pan. And there’s a lot to go in there. Yum! 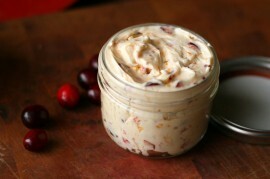 Place the other unrolled crescent dough on top of the cream cheese spread. In a small bowl, mix together the butter, remaining sugar, and cinnamon until you have a smooth cream. Next, spread that cinnamon sugar deliciousness right on top of the unrolled crescents. 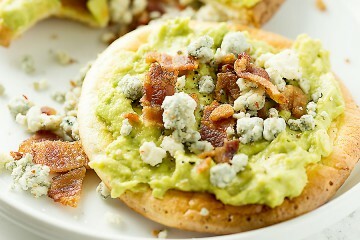 Spread it evenly over the top and don’t miss any spots. That would be a tragedy. Bake for about 30 minutes and let them cool completely before cutting into squares. 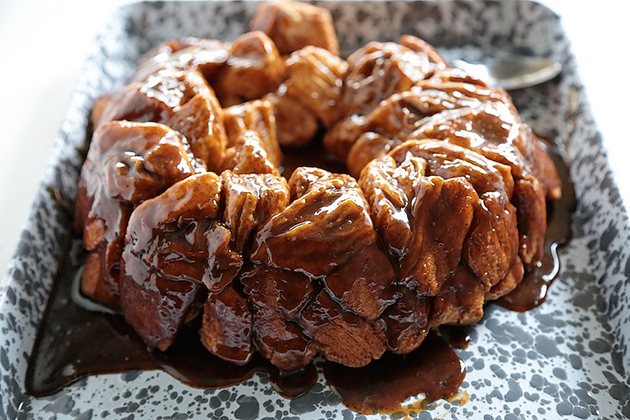 Top with drizzled honey just before you serve these delights. 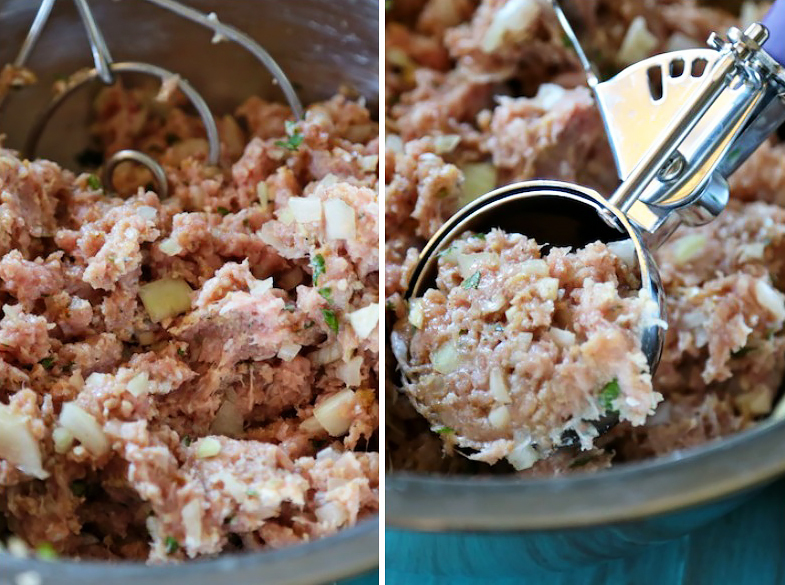 These will be a crowd-pleaser at your next BBQ or summer family reunion. I bet they would be the first thing from the dessert table to disappear. Make them soon and find out! If you need more summer inspiration, try this Seared Salmon with Browned Butter Lime Sauce, also from Jennifer’s blog In Jen’s Kitchen. And be sure to stop by her TK recipe box for more delicious creations! 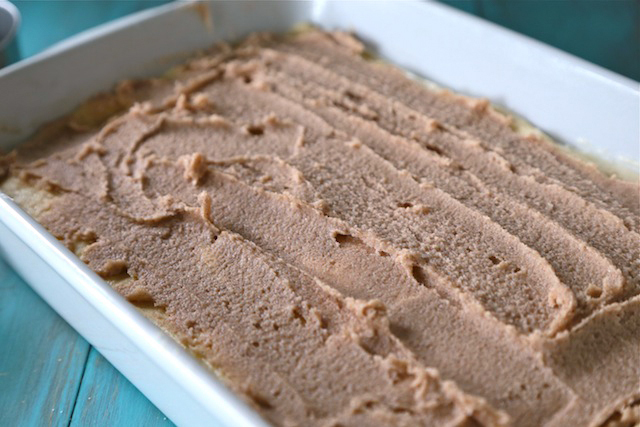 What are your favorite summer crowd pleasing desserts? Leave a comment below, or share a link to your Tasty Kitchen recipes for all to see! See post on Jennifer Kimbrell’s site! Creamy cheesecake sandwiched in between flaky layers of crescent dough, smothered with a dreamy cinnamon sugar butter and drizzled with honey while it’s warm. 1. Preheat oven to 350 F. Spray a 9×13″ baking dish with cooking spray. 2. 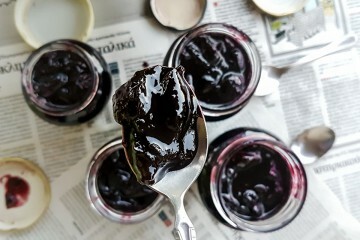 In a mixing bowl using an electric mixer, beat the cream cheese with 1 cup of sugar and the vanilla extract until smooth. Set aside. 3. 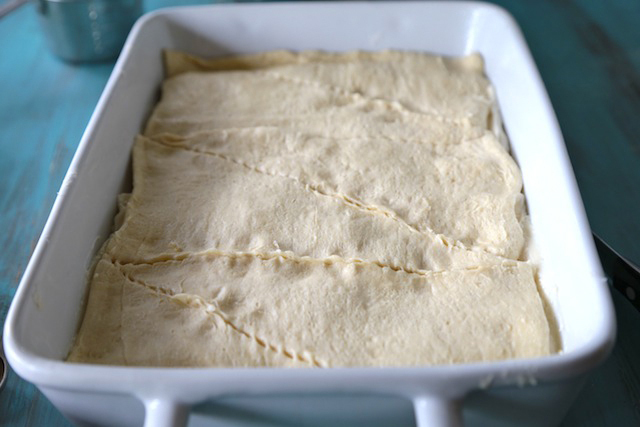 Unroll 1 can of crescent dough and place dough into the bottom of the 9×13″ pan (I just press the seams together). Evenly spread the cream cheese mixture over the crescent dough. 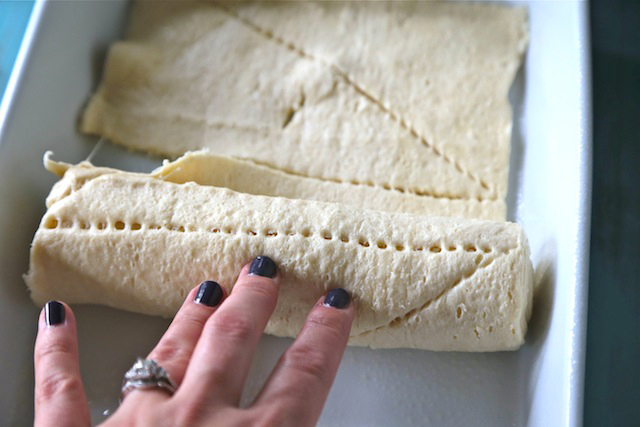 Unroll the other can of crescent dough, press the seams together, then place it on top of the cream cheese layer. 4. Stir together the remaining 3/4 cup sugar, butter and cinnamon. Dollop the mixture all over the top of the crescent dough. 5. Bake in the preheated oven until the crescent dough has puffed and it is golden brown, about 30 minutes. 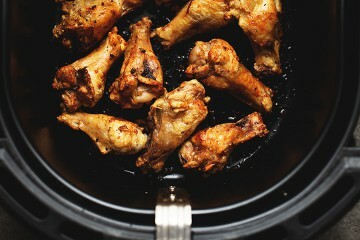 Remove from the oven and drizzle with honey (just drizzle straight from the bottle and eyeball the amount). Cool completely before cutting into 12 squares. Enjoy! Note: I usually keep these refrigerated, but store them however you prefer. 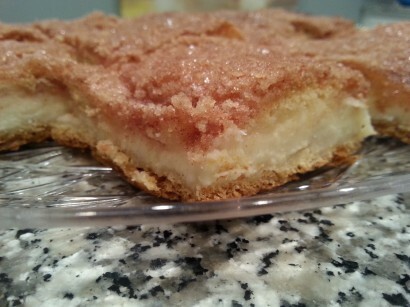 Recipe adapted from From Allrecipes.com, Sopapilla Cheesecake Pie. If you’re like me and want to feed your family fun, new dishes worth raving about, you come here to Tasty Kitchen for inspiration. And even more so when you’re trying to find recipes that are healthy! I’ve found so many wonderful, healthy creations to make in my own kitchen. This one from Jen for Greek Stuffed Peppers with Feta & Spinach was perfection. 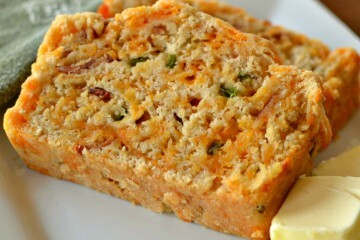 It’s packed with whole grains, vegetables, and even a little cheese so you don’t feel like you’re left wanting. So if you are looking for a Meatless Monday meal, or just to incorporate more vegetables into your routine, these are a sure-fire hit. 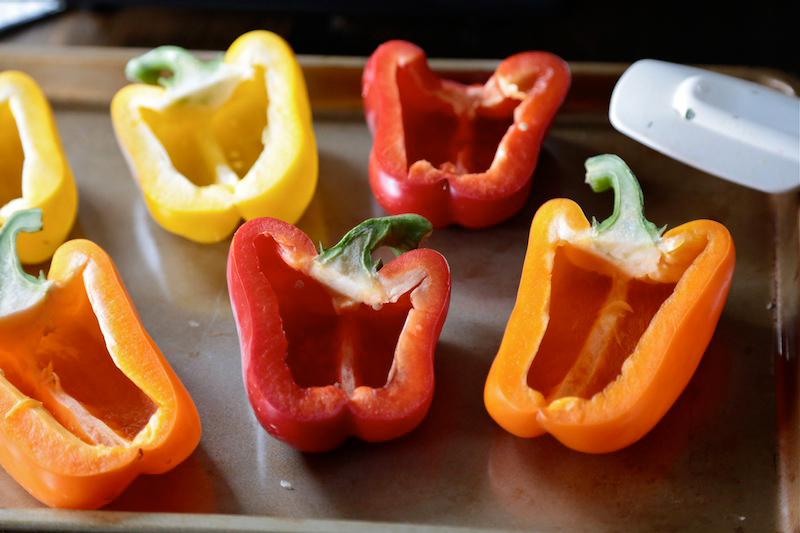 Stuffed peppers are always great for weeknight meals. 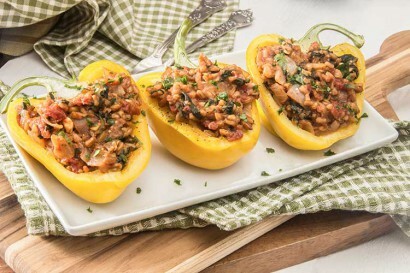 For these, round up bell peppers, farro (or its cousin barley), onion, canned tomatoes, olive oil, garlic, vegetable or chicken broth, spinach, and crumbled feta cheese. And whoops, don’t forget the spinach! I used a package of frozen chopped spinach and thawed it in my microwave according to the package directions. After the spinach is thawed, be sure to squeeze it out well to get rid of any extra water. The extra water will just make the pepper filling soggy, and no one wants that! Preheat your oven to 350ºF. Next, prepare your bell peppers. Slice the peppers in half and remove the inner seeds and the white pith. Place them on a baking sheet and brush with a little olive oil. Place them into the oven and bake until fork-tender, about 20 minutes. 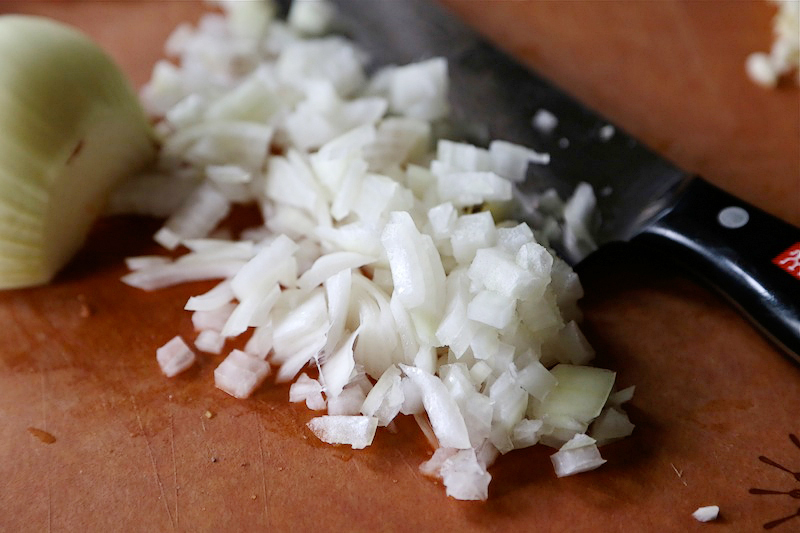 While the peppers are in the oven, move on to chopping the onion. Chop it into fine pieces. 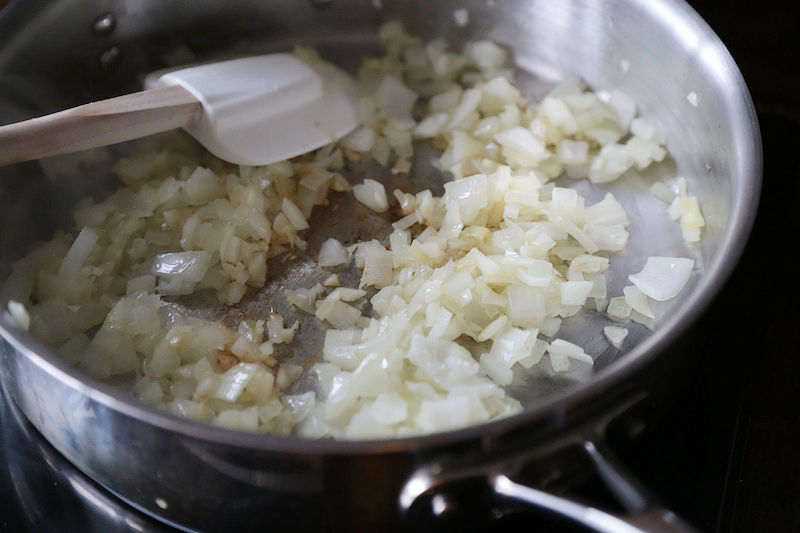 In a sauté pan over medium heat, add in a little olive oil and heat until glistening. Saute the onions until they are soft and just starting to turn translucent. Then add in the garlic and sauté until just fragrant, about 1 minute. Next, add the broth. I used chicken broth because that it what I had on hand. But to make this truly vegetarian, be sure to use vegetable broth. 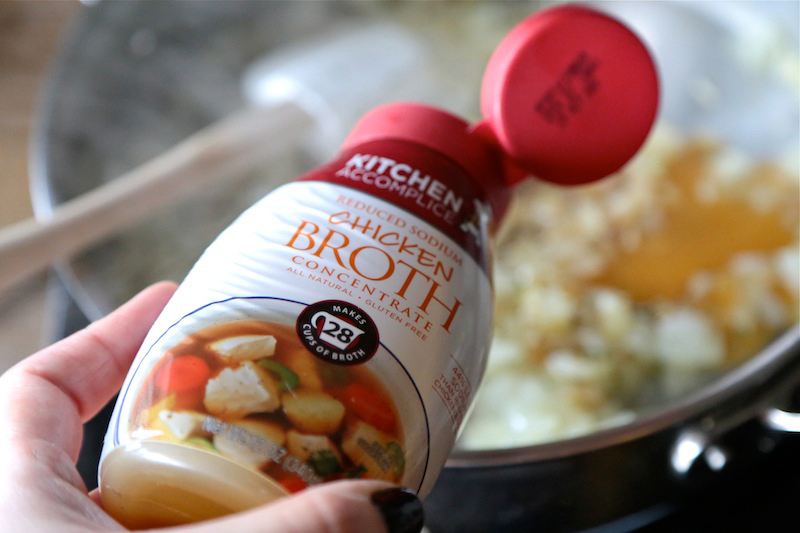 This concentrated chicken broth bottle was a neato find at my grocery store. 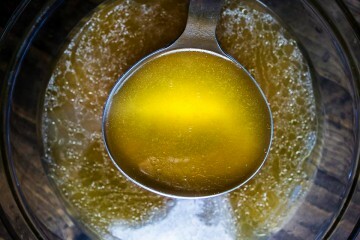 It only requires 2 teaspoons of concentrate, and 2 cups of water to make chicken broth. It’s handy so I don’t have lots of half-opened containers of broth in my fridge. My husband is very thankful for this discovery! 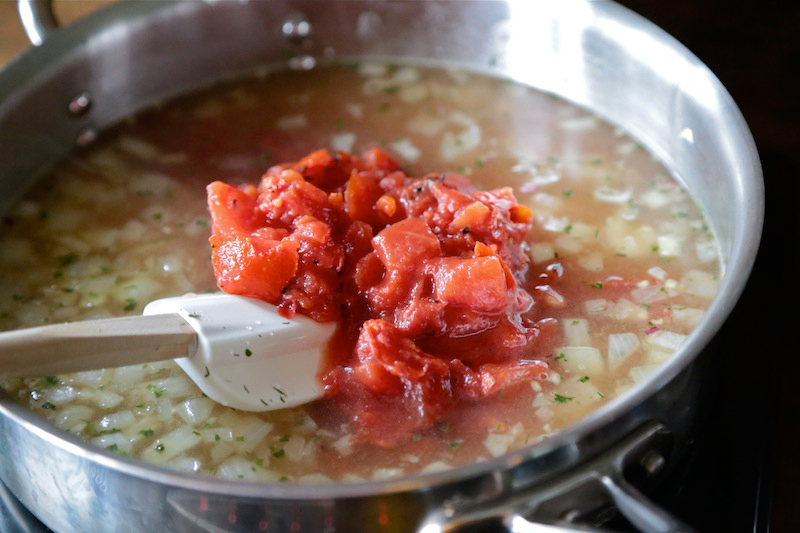 Once the broth is added in, the tomatoes are next. Along with the farro! 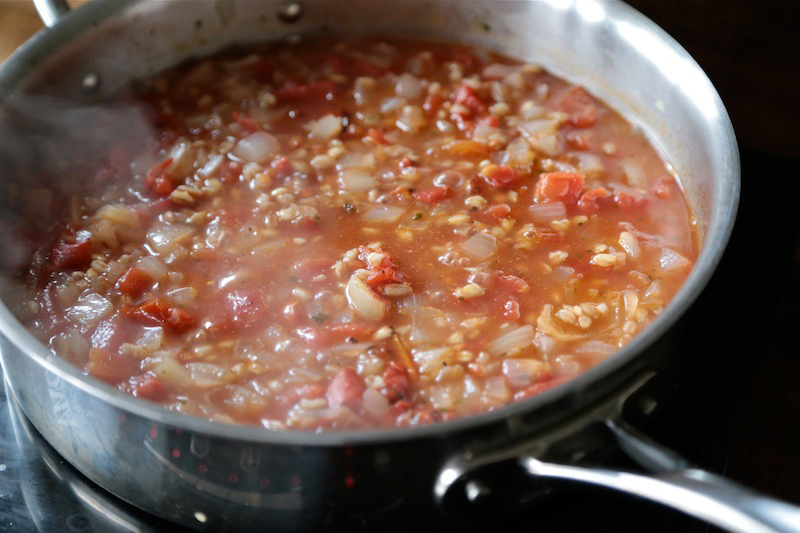 Farro and barley are whole grain cousins, so use either one for this recipe. Add in the remaining spices and bring the whole mixture up to a simmer. 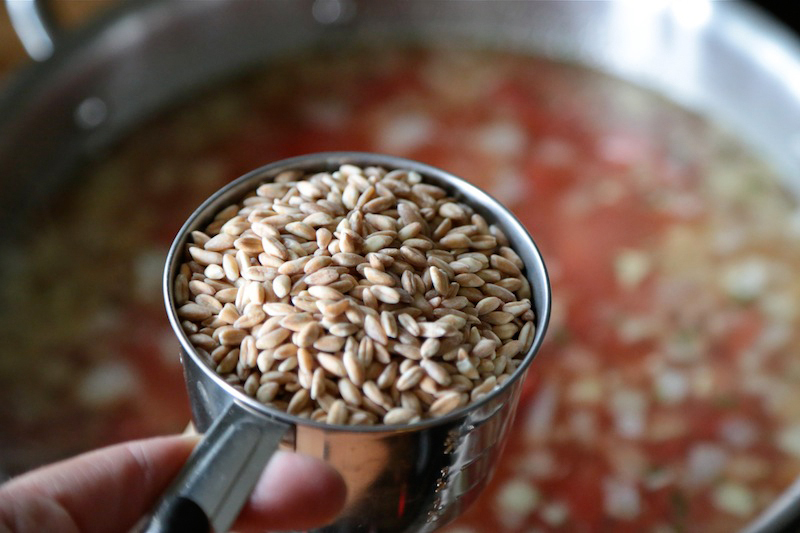 Cover and let it do its thing until the moisture is absorbed and the farro is soft. 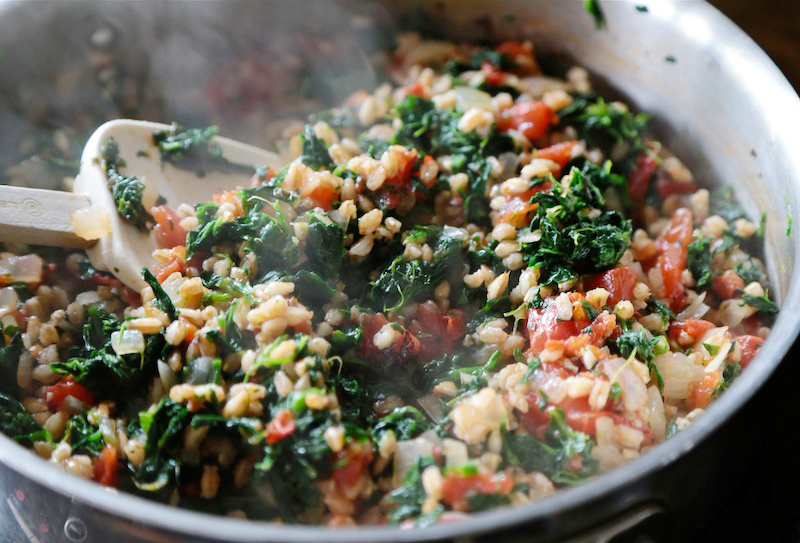 Once the farro is done, it’s time to add in the spinach. Fold it in until it’s mixed evenly. Then it’s time for the pine nuts! For the finishing touch, add in half of the crumbled feta and fold in to combine. 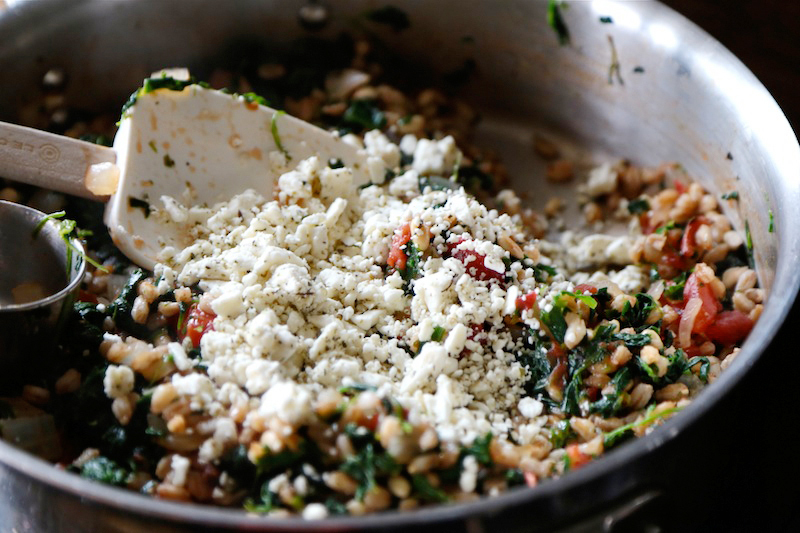 Fill each roasted bell pepper with a healthy dollop of the farro vegetable mixture and crumble the remaining feta on top. Serve immediately. I had so many of these left over that I ended up eating them for lunch the next day and they tasted incredible. 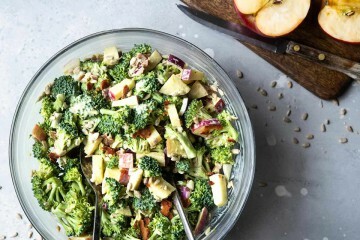 Take them to lunch for a twist on a cold salad. If you need more healthy inspiration, check out these Coconut Vegan Pancakes! 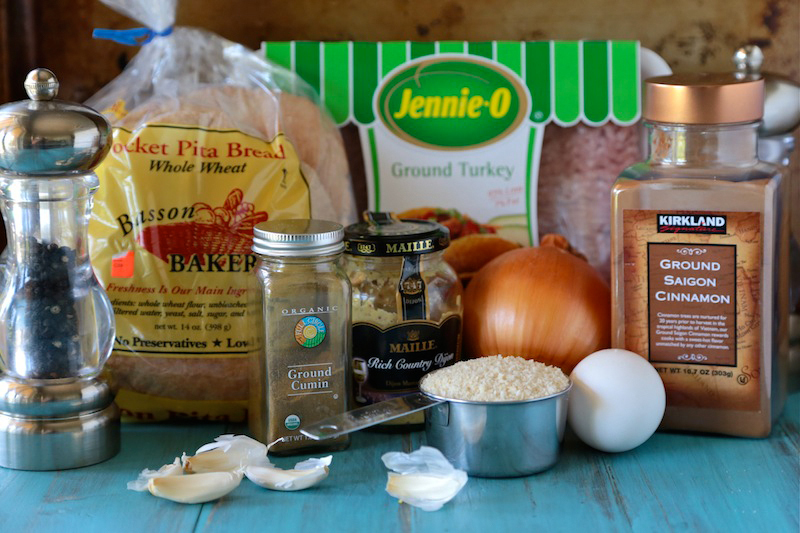 Thanks for sharing your recipe, Jen! Be sure to stop by Jen’s blog, The Scrumptious Pumpkin, and her TK recipe box for more delicious creations. Do you incorporate a meatless meal into your weekly routine? What is your favorite meatless meal? Leave a link to your favorite or shout it out in the comments for me and your Tasty Kitchen friends to find! 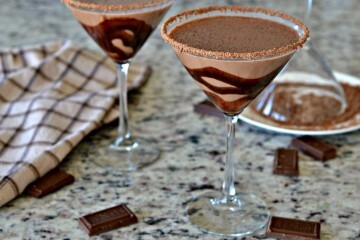 See post on The Scrumptious Pumpkin’s site! 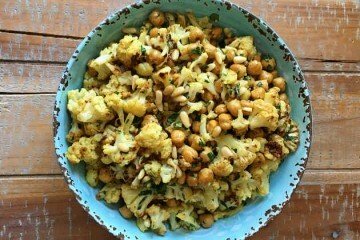 A healthy meatless meal idea! 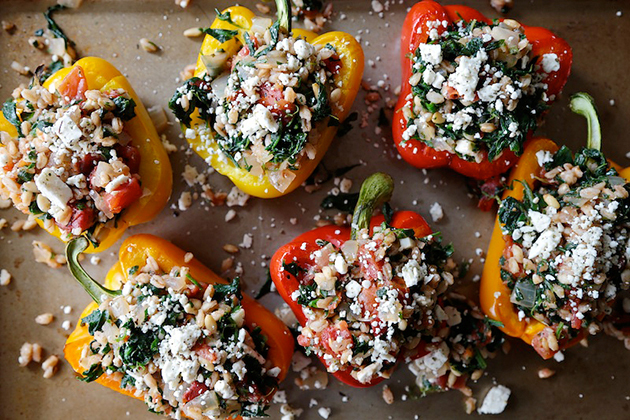 Greek-inspired stuffed peppers, richly flavored with spinach, tomatoes, pine nuts and feta! 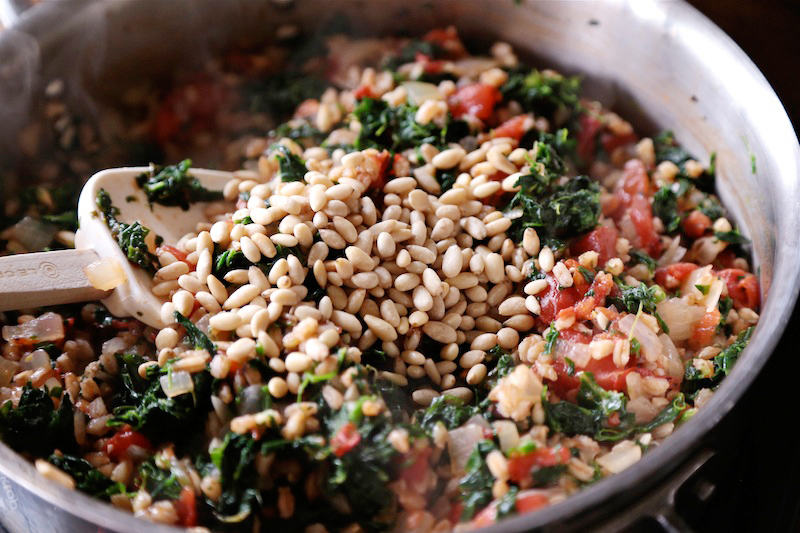 Meanwhile, as farro cooks, arrange pine nuts on a parchment-lined baking sheet and toast in the oven for about 5-7 minutes, or until lightly golden. Watch carefully because they burn quickly! Set toasted pine nuts aside. 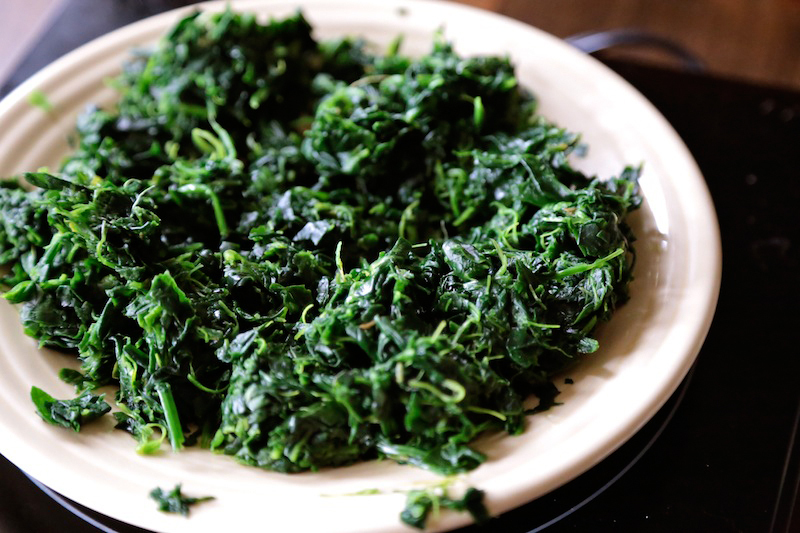 Increase oven heat to 400 F.
Meanwhile, measure out the frozen chopped spinach and place it in a heat-safe container. Microwave for 30 seconds at a time until thawed. When cool enough to handle, transfer thawed spinach to a fine mesh strainer. Arrange the strainer over a large mixing bowl and squeeze spinach, wringing it dry, until all excess water is drained from the spinach. 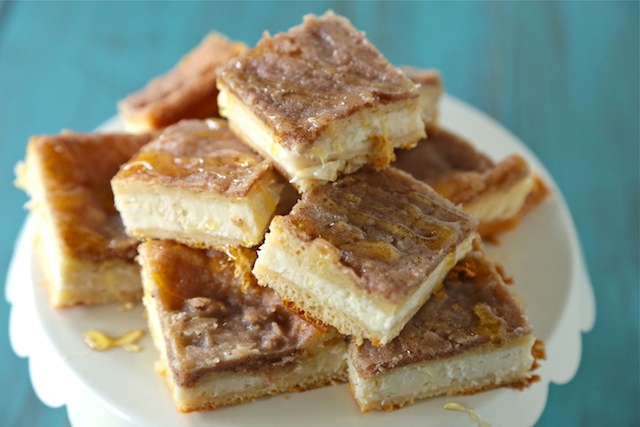 These require just a few basic ingredients that you probably already have on hand. The most time-consuming part may be roasting the sweet potatoes, so I suggest doing that beforehand to save some time when you make these Saturday morning. You can’t beat the smell of warm gingerbread, especially in the winter. It’s such a warm and cozy smell, especially fresh out of the oven. 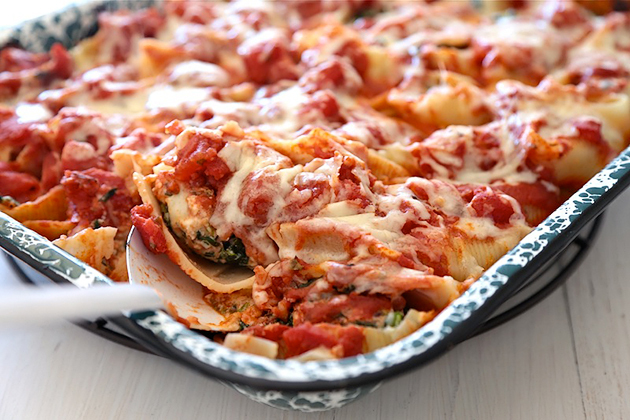 Emily has totally set the bar with this Spinach and Prosciutto Stuffed Shells dish. 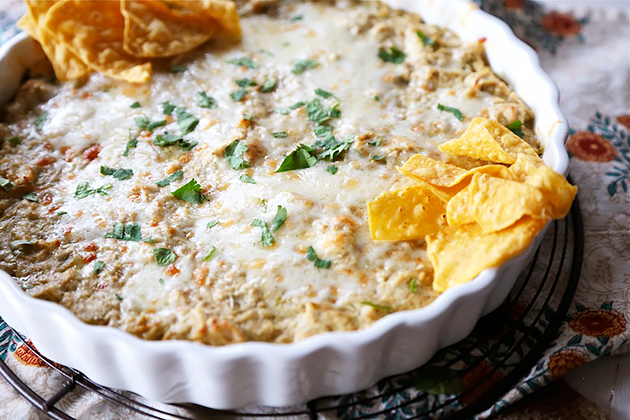 The flavors are out of this world and, dare I say it, make even more amazing leftovers! 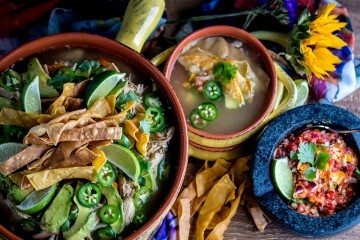 There is never a time that Mexican food doesn’t sound good. It sounds good all the time: the flavors, the cheese, the limes, the spices ... I’m hungry just thinking about it.